LAND Rover have confirmed their long-awaited new Defender will be revealed during 2019 and will be on the road in 2020. Testing of the new vehicle is currently under way around the world and is due to start in North America in the next few weeks. There, Land Rover engineers will subject the vehicle to rigorous test extremes to make sure the new Defender is the most off-road capable Land Rover vehicle ever. During the test programme, the new Defender will be operated in temperatures ranging from -40C to +49C, while it will also be driven on and off-road at altitudes of more than 13,000 feet above sea level. 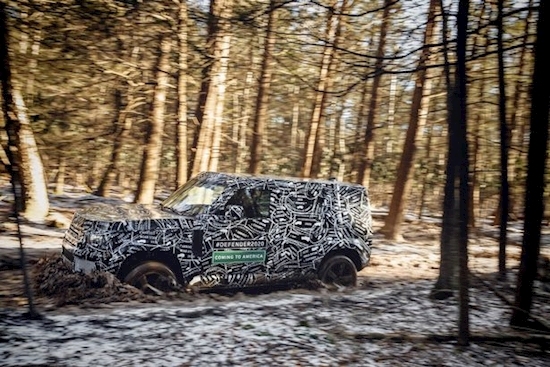 The company have just released the first official images of the new model in heavy camouflage undergoing its off-road development and the new Defender has already been spotted in the UK during its trials on roads around Land Rover’s research and development centre at Gaydon in Warwickshire. Land Rover have been without its stalwart model for the past two years, when the last of more than two million to be produced since 1948 rolled off the line at the company’s Lode Lane factory in Solihull. Since then, a number of special-edition models have been put into production, some with prices in excess of £150,000. In the years since its creators Maurice and Spencer Wilks first sketched out their ideas in the sands of Red Wharf Bay on Anglesey, just after World War II, Land Rover habe become the world’s leaders of 4x4 models and their vehicles are now sold in almost 200 countries. The Series l Land Rover earned the accolade of being the most versatile vehicle on the planet, capable of taking owners to the places other vehicles couldn’t reach. In 2015, a unique milestone Defender – the Defender 2,000,000, sold for a record £400,000 – a far cry from the original £450 the first Land Rover sold for at the 1948 Amsterdam Motor Show. Rawdon Glover, Jaguar Land Rover managing director in the UK, said: “We are enormously excited to be revealing the first member of the Defender family during 2019, with UK customers taking delivery in 2020. Land Rover say the new Defender will have an all-new exterior and interior design true to the shape of the original. “When it debuts in 2019, the new model will represent 70 years of innovation and improvement – honouring the model’s heritage for rugged durability, while remaining a Defender for the 21st century,” say the company.